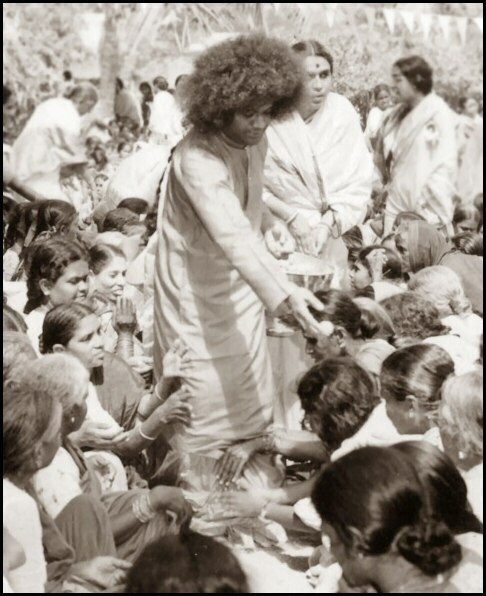 Time was when the name Sri Sathya Sai Baba conjured up the image of a slight orange-clad figure with an Afro hairdo who performed miracles. Today most Indians view him as a spiritual leader who inspires harmony between people of all faiths; as an ideal educationist who runs totally free educational institutions; as a social worker par excellence who has brought drinking water to the poorest of the poor in Andhra and Karnataka and even to the metropolis of Chennai; as a healthcare provider who has set up globally acclaimed hospitals where everything is free; and as one whose devotees have a passion for “selfless seva”. However, what is amazing is the stupendous global impact he has had, though he has never stepped out of India except once in 1968 when he visited Africa. Broadly, the global activities carried out in the name of Sri Sathya Sai Baba can be divided into Educare, Medicare and Sociocare. EDUCARE: Education enables one make a living; while educare enables one attain the highest in life. Educare helps one realise that one is not separate, but part of creation, which is in turn part of the Creator; and what is more, so is one’s neighbour. Baba’s educare programme which began in the sixties in India through the Bal Vikas project has now reached 180 countries. Three time Thai parliamentarian and ex-NASA scientist, Dr. ART-ong Jumsai, is a pioneer who has dedicated his life to educare; and thanks to Dr Jumsai and likeminded devotees, today there are Institutes of Sathya Sai Education (ISSE) in all continents. The Institutes train teachers in Educare and carry out research on the impact of Sathya Sai Education in the world. There are 52 Sathya Sai schools globally. MEDICARE: Sai Centres abroad have been running many free clinics and medical camps for over two decades. A coordinated medicare programme has been launched recently under the auspices of the Sai International Medical Committee to reach Sai Ideal Health Care everywhere. The activities include Ongoing Healthcare Delivery, Disaster Relief, Medical Camps and Health Care Services, Disease Prevention and Health Education. In the Far East, Africa, Latin America and South Asia, in partnership with private hospitals, which offer free theatre and ward services, regular medical and surgical services have been available for the needy. An ideal hospice for the terminally ill is functioning in Sri Lanka. In a major step forward, Sai Organisations are also tying up with governments in the implementation of National Health Programmes; for example, in Kenya the Sai Organisation distributes insecticide-treated mosquito nets to populations at risk of malaria no matter how remote and inaccessible the terrain; and this unique Sai Net programme has generated global interest. In the USA and other developed nations, Sai Medicare targets those who are not insured and have no access to healthcare. In appreciation, the Mayor of St Louis, proclaimed the 11th of September as Sri Sathya Sai Baba Day, last year. SOCIOCARE: Sociocare programmes done by Sai Organisations in various nations are just too many to enumerate. However the water management project being implemented by the African Institute of Sathya Sai Education (TAISSE) merits mention. The Experts Group Meeting of water experts convened in 2001 by the UN-Habitat, the United Nations Environment Programme (UNEP) and the Sweden International Water Institute at Johannesburg was taken up by the Human Values approach to water management suggested by Victor Kanu of TAISSE. In fact, TAISSE was contracted by UN-Habitat to implement Value Based Water Education in six African countries. Water education is a combination of water literacy — knowledge about water sources, and, Value Based Perception — where water is viewed as a precious resource to be used responsibly for the the greater common good. Waterbodies are viewed as gifts given in trust to us to be safeguarded and passed down to future generations who are to inherit the earth after our time. By 2004, the project was completed so successfully that UN-Habitat has now requested TAISSE to implement a Value Based Water, Sanitation and Hygiene Education in 12 African countries. Taking a leaf out of Baba’s Anantapur Water Project, devotees at Ndola, Zambia, have also started a small water project. Thanks to it, five poor townships and water-starved for centuries, have potable water today. Latin America is another region where powerful Sai sociocare projects are on. The Director of a prison at Sensuntepeque, El Salvador, was so touched by the Sai Study Circle meetings in the prison, that he volunteered to do the Sathya Sai Human Values Diploma Course. In Beunos Aires, an ideal home for street children exists with a typical Sai twist to the tale. They used to live in a makeshift cramped place. While gardening one day, the kids found 12 kilos of pure gold in a flowerpot. Their street instincts told them to go for the gold and run away; but after all the EHV they had been taught, they simply could not. They notified the elders who notified the police and finally the courts declared that the gold belonged to the boys. With that money, a lovely home was built. What is absolutely amazing is this: most volunteers participating in the Sai educare, medicare or sociocare projects abroad have not even seen Baba; but they are all full of love for this gentle eighty-year-old who lives in India, whom they refer to as the Avatar of the age. What is more, they are able to sense and feel his love for them across oceans and continents; and they are transmuted as it were. Of all the wondrous things Sri Sathya Sai Baba has created over the years, this transformation of hearts the world over remains his greatest miracle. “Music always enthralls, elevates and produces a feeling of ecstasy. Music is the grand road to mukti,” says Sri Sathya Sai Baba. It is with this in focus that ‘Divinity’, the new arts club of the Sri Sathya Sai Institute of Educare, Chromepet, was inaugurated recently at the school. The inaugural function, aptly named ‘Sai Sunad’, was hosted by former students of the Sri Sathya Sai Institute of Higher Learning, Puttaparthi. The three-hour programme was chaired by renowned Carnatic vocalist O S Arun and Sowmiya Madhangopal, renowned Hindustani singer. The programme commenced with the lighting of the traditional lamp by O S Arun. He later spoke about music and his experiences as a singer. He said music was the easiest way to reach God. Emphasising on its beauty, he stated that it was as serious a subject as science. He sang two popular Sai Bhajans, much to the delight of the large audience. O S Arun is a postgraduate in music. He was awarded the Kalaimamani award and Music Academy’s Best Vocalist Award. He hails from a family of illustrious singers. He then distributed prizes to Bal Vikas students who had won the Tamil Nadu state-level music competition. Later, Sowmiya Madhangopal enthralled the gathering of students, parents, and Sai devotees with nine heavenly bhajans sung in typical Hindustani style. As a fitting finale, the young Bal Vikas students, who won the Tamil Nadu state-level music competition, rendered five beautiful songs on Sai Baba in various languages that mesmerised the audience. School principal K Sai Meera proposed the vote of thanks. The programme concluded with the school’s correspondent P Kumaraswamy performing the mangala aarathi. Sri Sathya Sai Institute of Educare is a CBSE-based school situated in the rural environs of Nemilicherry, off Chromepet. It is run on the principles of the Sai system of education. The partially-residential school provides quality education totally free of cost. The Sri Sathya Sai Institute of Educare celebrated in a grand manner the 82nd birthday of Sri Sathya Baba on November 23. Chief guest S Sethuraman, regional manager, TVS Motor Co Ltd, launched website of the school, www.sssieducare.org This is a milestone in the history of the school. The website was conceived by K Venkatesh, a former student of the Sri Sathya Sai University, Puttaparthi. The schoolchildren made a beautiful rangoli of Sri Sathya Sai Baba in the prayer hall. A swing was assembled and decorated by students themselves for Sai Baba. The swing is a special custom in Puttaparthi. In the earlier days, on November 23 every year, Sri Sathya Sai Baba used to give darshan to devotees in the evening. A Power Point presentation was also conducted depicting photos of Sri Sathya sai Baba’s life and mission. The programmes were conducted in the form of a conversation between two great sages, Sri Ramakrishna Paramahansa and Swami Vivekananda, who witness the birthday celebrations and mark their observations. It was a treat to see the tiny-tots perform. The chief guest remarked that every programme that was performed was from the heart and the same could be felt throughout the day’s events.